Bring large pot of salted water to a boil. Add pasta and cook for approx. 8 min., or until al dente, according to package instructions. Meanwhile, clean and peel outside leaves from Brussels sprouts, then halve. Drain pasta and transfer cooking water back into pot. Add Brussels sprouts and blanch for 3 – 5 min. Drain Brussels sprouts, reserve some cooking water, and set aside. Pat Brussels sprouts dry. Melt butter in a frying pan over medium heat. Add honey and Brussels sprouts. Season with salt and pepper. Sauté Brussels sprouts for approx. 5 min., then set aside. Add chopped bacon to the pot and fry until crisp. Grate Parmesan cheese. Add pasta, cooking water, Parmesan, and egg yolks. Season with salt and pepper. Stir to combine. 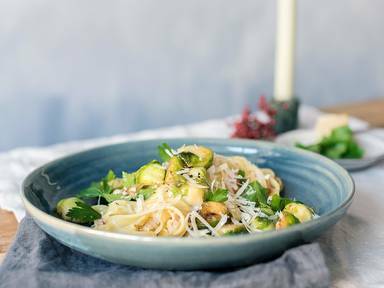 Serve pasta with Brussels sprouts and garnish with parsley and grated Parmesan. Enjoy!